Before sport and tool watches such as the Rolex Submariner and GMT’s was the Rolex DateJust. Prior to the tool watch boom of the mid-1950’s was the release of the Rolex DateJust. Even though the DateJust did not have tool-like functions as a chronograph or rotating bezels, the DateJust brought forward many design breakthroughs that are commonplace today. Debuting in 1945 on Rolex’s 40th anniversary, the DateJust possessed yet another Rolex innovation with a automatic date mechanism advancing precisely at midnight without delay, and the reason for the “just” in DateJust referring to the date advancing “just-in-time.” The date window was located at the 3:00 o’clock position so that it could be easily peak out from under a shirt sleeve. That was just the start of the DateJust’s functionality. The Rolex DateJust also introduced a sweeping central second hand rather than a subsidiary second hand that was commonplace of the period. 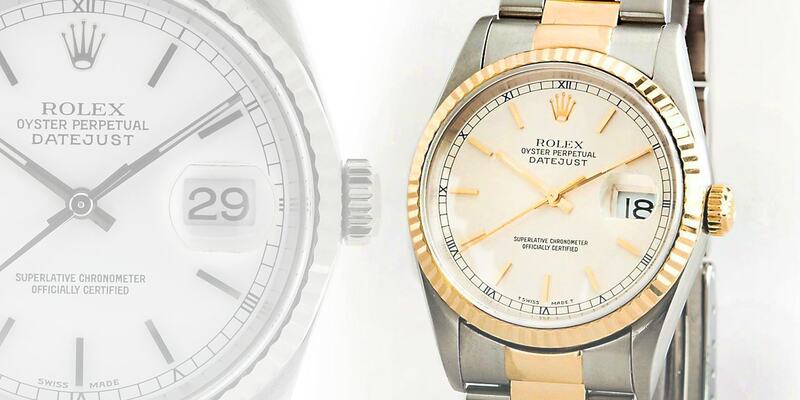 Rolex incorporated into the DateJust other previously released innovations such as the sealed winding crown, and the perpetual winding mechanism that set a new standard for durability and functionality in the Swiss watch industry. A sweeping central second hand made timing easier to read and combined with a date window, made the DateJust a tool watch for simple daily tasks of finding the date without a wall calendar, and to easily tell if the watch is running. These new functions paired with the automatic winding rotor and the waterproof winding crown made the Rolex DateJust one of the first watches that could survive daily rigors without having to wind for reset the watch because the automatic winding mechanism provided consistent power to make the watch extremely accurate. Continuing to this day, the Rolex DateJust incorporates functionality and ruggedness found on sport watches, but finished in a way that is fitting for the board room. The Rolex DateJust uses the same durable and highly polishable 904L stainless steel found on sport watches, as well as in 18K gold, and unlike sport watches, available in platinum. DateJusts also share with sport/tool watches sapphire crystals, SuperLuminova or Chromolite on the dial and hands. DateJusts were traditionally smaller than tool/sport watches measuring at 36mm in diameter, but DateJusts are now available in 40mm (Milgauss), 39mm (Explorer I), and 41mm (DateJust II and President). The Turn-O-Graph, predecessor to the Rolex GMT, is a DateJust with a rotating bezel, useful for timing parking meters and other functions that are less than an 60 minutes. Unlike Rolex sport watches, the DateJust is available with a Jubilee bracelet and does not have a OysterLock on the on the bracelet clasp. The DateJusts use Rolex’s TwinLoc winding crown which is smaller in size than the TripLoc crowns, but have proven no less waterproof when staying within the 100m depth rating. The DateJust was initially designed to be the everyman’s watch and with its durability and style over the last 60 years, it has certainly proven itself to be so.